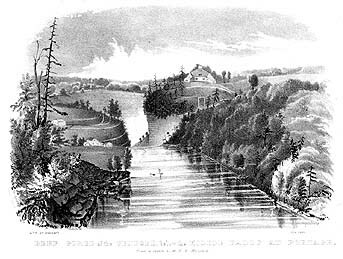 "Deep Gorge of the Genesee, below the Middle Falls at Portage"
"from a sketch by E. N. Horsford"
"Lith. of Endicott, New York". This sketch was made from the western bank near the Upper Falls, and gives us one of the earliest looks at what would, two decades later, become the Glen Iris. The top of the Middle Falls is in the center of the picture, with the building that would become the Glen Iris to the upper left. The structures just to the left of the Falls may be mills or some of the structures found in Images 1, 26, or 28 . The structure on the eastern bank, beyond the Falls, is Hornby Lodge. Below this remarkable home is the southern entrance to the tunnel which was being contructed for the Canal at the time. For more information, see our Glimpses of the Genesee Valley Canal, and Pioneer Era., and Hornby Lodge.